I’ve been at this cocktail thing a long time. A little more than eight years ago, if memory serves, I bought my first bottle of rye, tracked down a copy of David Embury’s The Fine Art of Mixing Drinks on eBay (price: $10 — oh, how things have changed) and started mixing the hell out of everything. But over the years (as the dwindling frequency of posts here suggests), I’ve grown lazy and jaded on some issues related to creative drinks, and the transformative episodes of finding a rare spirit or tasting a paradigm-shifting cocktail are now fewer and much further between. Still, I’ve had my moments, and some of these have been quite memorable, based largely on the olfactory experience of a particular drink. This isn’t surprising, of course; the sense of smell has a tighter link to memory than any of our other senses (or so I recall reading somewhere, and it seems to make sense so I’ve stuck with it so far). And while I sometimes struggle to recall the precise flavor of a certain whiskey or of a once-mindbending cocktail, there are experiences I recall with complete clarity, due largely to the assertive aroma of a particular drink: the first Sazerac I had that was mixed with French absinthe (rather than Pernod or Herbsaint in those not-so-long-ago times when absinthe was still verboten), as the ethereal fragrance of green anise wafted up from the glass; or the moment at a Tales of the Cocktail past, as Eric Seed from Haus Alpenz poured sample cups of the not-yet-released Smith & Cross in a crowded tasting room and I caught the lascivious funk of the rum’s aroma from a full 10 feet away. And another? The Gin Basil Smash is right up there. The Gin Basil Smash has a history that is blissfully short: created in 2008 by Jorg Meyer at his bar, Le Lion in Hamburg, the drink has reportedly enjoyed a good deal of popularity in Germany and environs (and is the only cocktail I know of that has its own Facebook page). The drink’s composition is ludicrously simple: just a basic gin sour with the addition of fresh basil and the lemon shell, which you muddle together and shake before double-straining over fresh ice (or, more in tune with the drink’s inspiration, a contemporary-style smash with the addition of basil). Place basil and lemon shell in a mixing tin and muddle away (you can instead drop in half a lemon rather than a squeezed lemon shell, but you’re ramping up your muddling work a little). Add the remaining ingredients, fill shaker with ice and shake well until chilled, about 10 seconds. Strain into old-fashioned glass filled with fresh ice. Garnish with basil leaf. Anyway, whatever – the drink is absolutely delicious, yes, but it’s also intensely aromatic. With a big bunch of fresh basil going into the mixing tin, the cocktail comes out alluringly green, but also enormously fragrant, impressing it all that much more on your memory the first time you tuck into one, while also making what would otherwise be a simple gin sour into a more three-dimensional drinking experience. 8 Responses to MxMo Come to your senses: do you smell something in here? The large basil planet on the kitchen table is demanding that I make this drink right now. A beautiful drink and well-stated as always, Paul. Sounds delicious, and I just happen to have a bunch of basil lurking in my kitchen. Curious about the simple syrup — if ratio is unspecified in your recipes, do you use 1:2, 1:1, or 2:1 sugar to water ratio? I’m assuming 1:1, and will add a little extra syrup if the drink is too tart. I think you’ll find this article interesting and related. 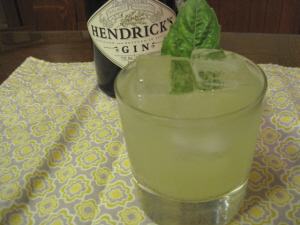 I have a deep and abiding love for the basil-gin combo, though I usually throw in some muddled cucumber too and turn it into a gimlet (http://hostessdiary.wordpress.com/2011/07/28/making-the-most-of-what-youve-got/). That’s fine in San Francisco, where it’s almost always chilly in the middle of summer, but I think your version would be much better in hot weather. I highly recommend keeping a basil plant in your kitchen or your backyard to make this drink. Since (for me) it’s so much about the aroma of the basil, and you just can’t beat a few spanking fresh leaves right off the plant. Every year different basil plants succeed in my yard, this year I had a slow growing purple and green variety with jagged leaves that makes a heavenly version of this drink. Enjoying one now as the freeze will likely do it in shortly. I find that if yougarnish with a piece of basil on a longish stem, it really enhances the flavor of the drink towards the end.